Copper Creek Canyon is located approximately 12 miles east of the town of Mammoth in southern Arizona. 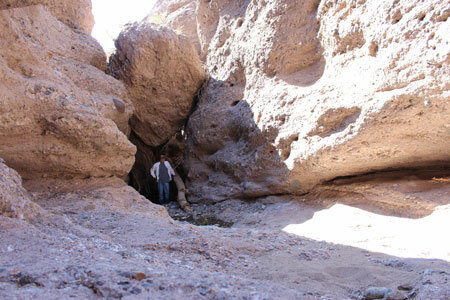 The upper canyon is best known as the site of several old mine ruins. 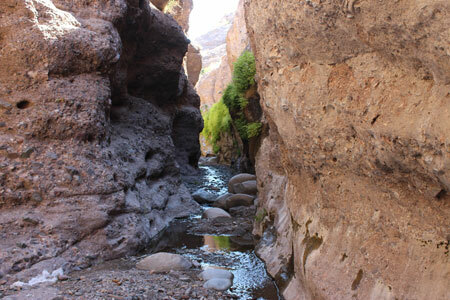 Fewer people know that downstream from the mines, the canyon walls become nearly vertical and the channel narrows to just a few feet in width. 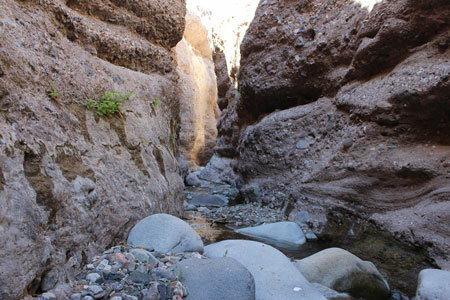 The gorge extends for several miles before the canyon once again opens up and the normally dry wash completes its run to the San Pedro River. In the cooler months of the year and when there is no chance of flooding it is a spectacular hike into this part of the canyon! 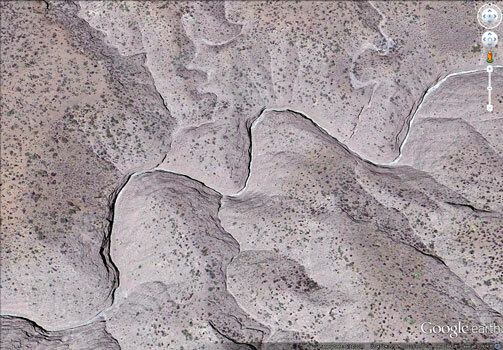 The aerial photo below from Google Earth shows the serpentine nature of the box canyon. Many of the turns are nearly 180 degrees. 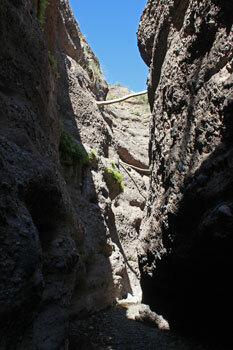 When I was there in early May, there were many large logs trapped high across the canyon walls. Those logs had apparently floated down after a period of heavy rainfall in 2012. They were not there when a friend and I had hiked into the canyon in 2010 or so. I would guess that several of the logs were more than 50' above the canyon floor! The rock that makes up the lower canyon seems to be a type of conglomerate. Its appearance does not suggest that it would be so highly resistant to moving water. The floor of the canyon was pretty clear. The larger boulders do not appear to have weathered from the sides of the canyon, but look more like the rock types seen in outcrops several miles upstream. 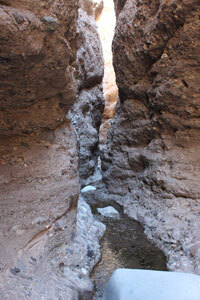 At times, the canyon became so narrow that the water was difficult to avoid. At those times, it was better to just plunge in and wade. I do not know if the water is perennial or not. 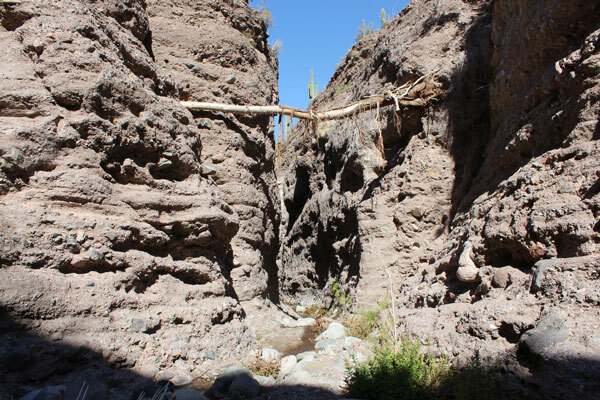 A couple of miles up from the mouth of the canyon, part of the cliff had fallen into the canyon and created a choke point. I was not able to make my way around it. An expert climber might be able to negotiate through a space underneath the fallen rock. That rock was not there on my previous trip. At that time, it was possible to hike clear through the box. Currently, it will be an in and back trip from the mouth of the canyon. Before the rockfall that is currently blocking access to the upper end of the box canyon, it was possible to hike down the canyon to the box from where the Copper Creek Road out of Mammoth crosses the creek. The only practical access at this time is to hike up from the lower end of the box and then hike back down. It is possible to drive to near the lower end on a moderately rough 4wd road off the Copper Creek Road. 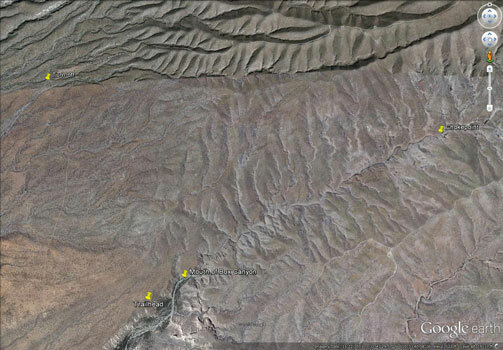 I have marked the turn-off, the trailhead, and the mouth of the box on a Google Earth Image. The "trailhead" is actually a pull-out in the old road. 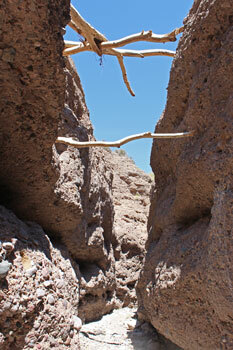 The road originally dropped down into the bottom of the canyon, but is not driveable beyond the pull-out today.